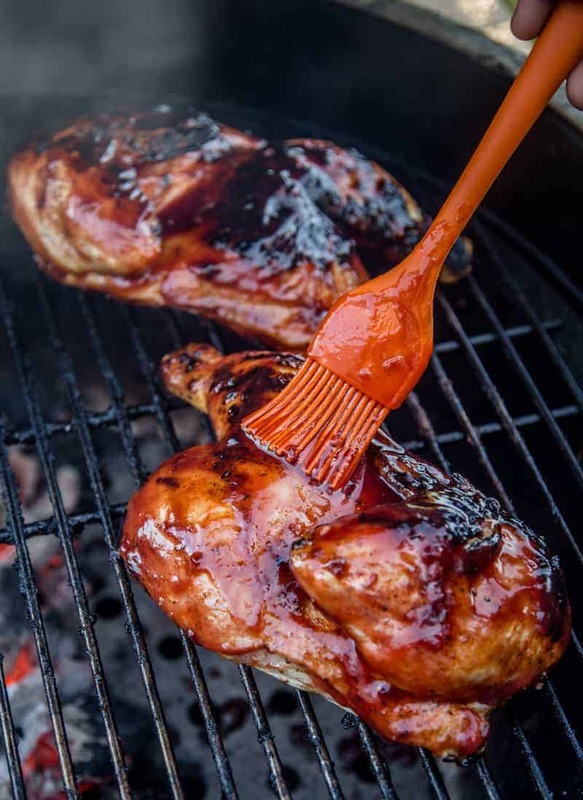 Jazz up Grilled Chicken with a sweet and spicy Cranberry Chipotle Citrus Glaze. 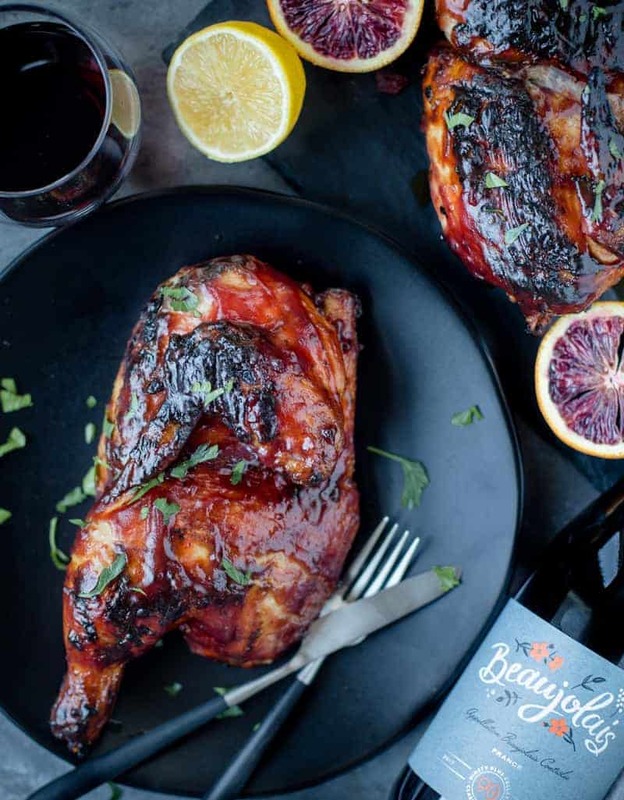 This chicken is sweet, spicy, tangy, and a perfect match for a bottle of Beaujolais! We’re always looking for new and exciting ways to jazz up chicken around here, especially when it comes to finding something to pair with a specific bottle (or style) of wine. Most days it’s the other way around; we make a dish, then find an appropriate wine to pair. But what if you want to make something to highlight a particular wine? 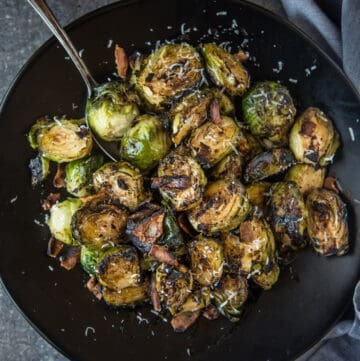 You create a dish that has flavors that will compliment or contrast, in order to showcase, the wine. Case in point Beaujolais. You may be hearing a lot about “Beaujolais Nouveau” right about this time of year. That’s because this time of year, Beaujolais Nouveau is released. What is Beaujolais Nouveau? Simply put, a new wine bottled and sold just weeks after it was harvested. There is even a day (Beaujolais Nouveau Day) celebrated in France on the third Thursday in November, marking the release of this fresh, tangy and very fruity wine. This year that day was yesterday. But NOT ALL Beaujolais falls into that category! While it may have the same grape (Gamay) and come from the Beaujolais region of France, it’s not in that same Nouveau category. Beaujolais is filled with great wine, but it’s younger, more youthful, brother gets a lot of the fame. I wanted to find something to honor this style. Richer and more complex than Nouveau, but not too intense. The wine is still fruity and fresh with bright strawberry and cranberry flavors, but has a spicy backbone and a more structure. 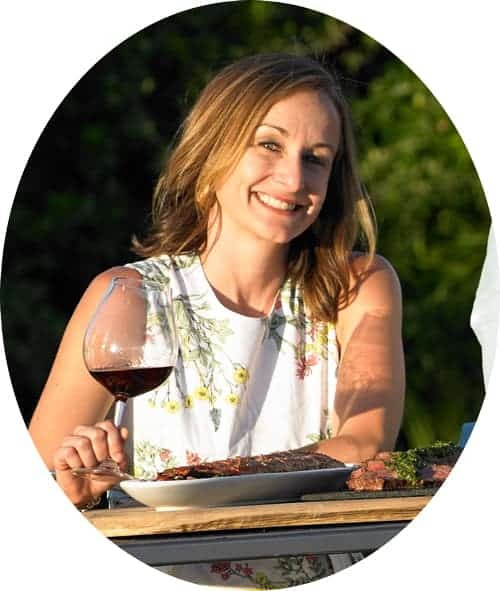 So I was pretty stoked when 90+ Cellars reached out to sponsor a post about Beaujolais and what kinds of food to pair. And ‘tis the season for cranberry everything, so we though that would be a fun flavor to play around with for a chicken dish. Cranberries are a major flavor component of this popular meatballs recipe we made years ago, so we decided to go for a similar flavor for this dish. I wanted to create a dish that would bring out those fresh bright fruit flavors in the Beaujolais, while also honoring the spice. And since cranberries are so sweet and tart we needed something spicy to counter that, hence the chipotle (for heat, baby!) and some citrus to provide some acid to offset the tartness. This combination is insane, people! While we do whole chickens quite often, we find that when you split a chicken you not only cook the chicken more evenly, but you’re getting more surface area on the chicken in order to get great grill marks and crispy skin. 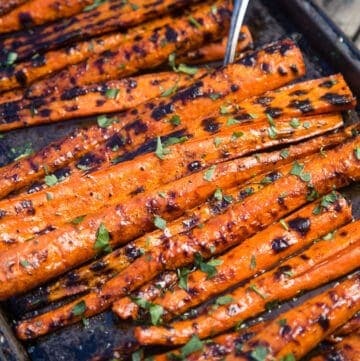 Plus we’re not slow smoking this dish, but instead cooking it on the grill at a high heat. If you can’t find a half chicken, buy a whole and have the butcher cut it in half for you. That’s what I do often, and in the case of this particular bird. I bought it in the fresh meat section, then walked it over to the butcher and asked if he’d kindly cut it for me. And he happily did! Easy peasy. After rinsing and patting the chicken dry we coated it with our Ultimate Dry Rub for Chicken or Pork. You’ll use about half a cup for one chicken. 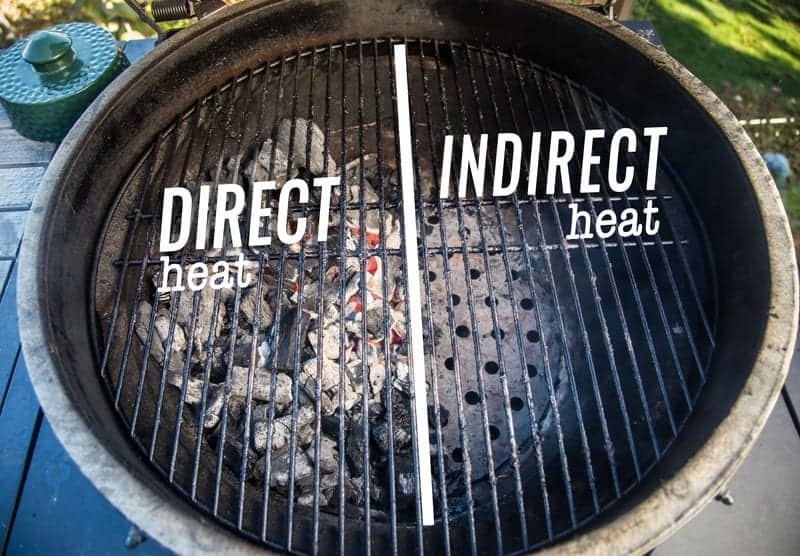 Set up your grill for direct/indirect heat cooking. We find with chicken that it’s easy to overcook it and get it charred (polite way of saying burned) when you only cook chicken over direct heat (i.e. directly over the flame). So we set up our grill so we have a two zone cooker. We have the direct side, where our charcoal is and most intense heat, and then we have our indirect side, where we have no direct heat. So with chicken, I am trying to avoid charring the outside over a high flame heat just to get to the internal temperature that makes for a safe and completely cooked chicken. If I just used a direct heat, then the most common outcome is a burned exterior while waiting for the actual meat to come to temperature. So I avoid this by getting my perfect sear first over the direct heat (this happens quickly), and then I use the indirect to finish the chicken. 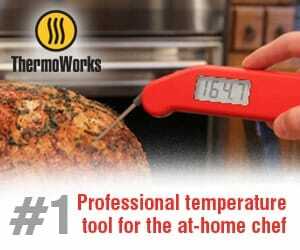 By moving it from direct to indirect, this avoids the flames from burning the outside with the gentler indirect heat. And if I happen to see a lot of flare ups, I move the chicken back and forth between the two zones until I get the seared texture I like, thus preventing the burn. Then I finish it on indirect where I don’t have to worry about the chicken burning once I get the crispy exterior that I like. Either before you put the chicken on the grill, or while it’s cooking on the indirect side, prep your glaze. This is a super easy cranberry glaze. We simply add the ingredients to a small sauce pot and let it simmer a bit. Garlic and the chipotle adds spice and backbone, while the chicken makes for a nice meaty flavor that pairs well with the wine. When we get close to our chicken being done (as determined by temp of 155 degrees F), we add our first of two glaze layers. This will allow the glaze to tack up, or infuse with the chicken. We do it once at 155, and again at 165 when we are pulling our bird. After a few minutes of cooling, it’s done and ready to eat. So once the chicken hits 155 degrees F, put on the first layer of glaze. Then, once it reaches 165 degrees pull the chicken, place your second layer of glaze on, and let it rest. Once the meat has sat for 10 minutes after having pulled off the grill, it’s time to dive in and eat!! Now all you need to do is pour yourself a glass of Beaujolais and you’re all set! 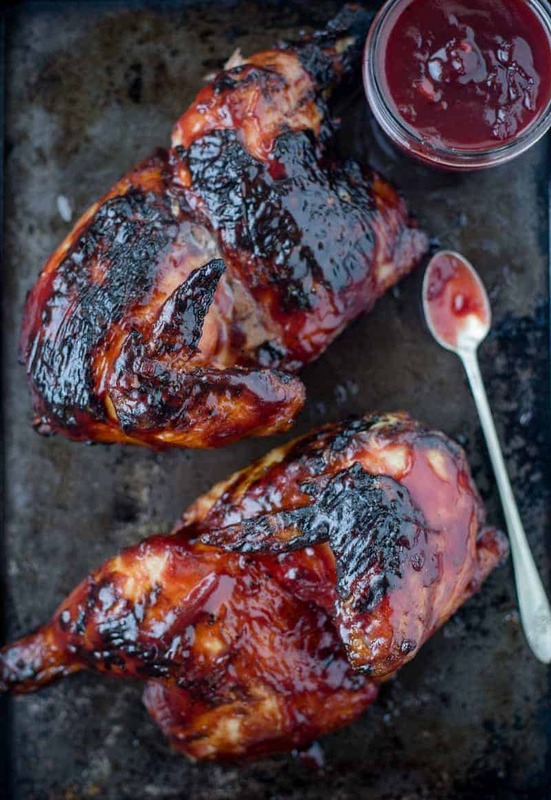 Recipe for Grilled Chicken with a sweet and spicy Cranberry Chipotle Citrus Glaze. This chicken is sweet, spicy, tangy. Preheat a small sauce pan over medium low heat. Add olive oil and garlic when pan is warm and sauté for about 3 minutes or just as the garlic starts to brown a bit. Add the canned jellied cranberries, orange juice, and lemon juice, and stir until it liquifies. Then add brown sugar, adobo sauce, diced chipotle pepper, and salt. Stir to incorporate and bring sauce up to a simmer. Simmer for about 10 minutes to thicken. Can be made in advance. Prepare your grill for direct/indirect method. Prepare chicken by washing and patting dry thoroughly. Add your dry rub liberally to both top and bottom of chicken. Can be seasoned 2 – 24 hours prior. Then move the chicken to indirect side of grill and cover, letting cook for another 10 minutes or until the internal temperature of the chicken at the thickest part (we check breast and thigh) reads 155 degrees Fahrenheit on an instant read thermometer. Once the internal temperature is at 155 it's time to glaze. Glaze both sides of meat and return to grill on indirect side until the internal temperature of the chicken in the same two areas reads 165 degrees Fahrenheit. 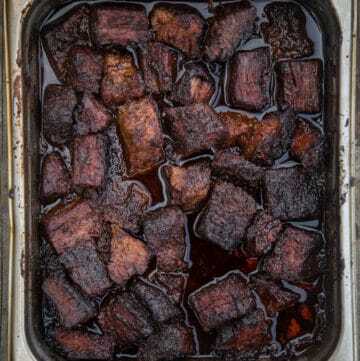 Remove, and then glaze a second time, and let it rest for 10 minutes. Then slice and serve with your favorite Beaujolais. We use our Ultimate Dry Rub for Chicken for this recipe. Feel free to substitute with your favorite chicken dry rub (but seriously, ours is awesome!). Most people lump Beaujolais into this light and festive category. 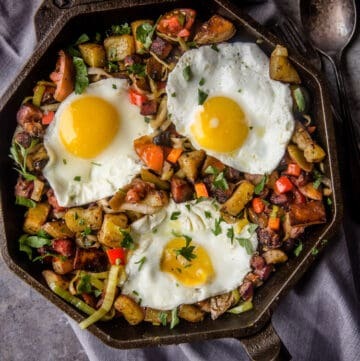 But it can have complex flavors (much like Pinot Noir) and can stand up to bolder foods. This particular wine had lots of bright red berry fruit and spice. 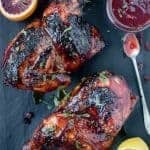 The sauce has a great combination of sweet and tart rich fruit from those jellied cranberries, but balanced out from the citrus and smoky and spicy chipotle. When paired together the sweet fruit of the wine tamed the spice and melded with the flavors of the cranberries. At the same time the chicken enhanced the spice and structure of the wine. It’s a really fun pairing and I’d love to hear what you think about it! 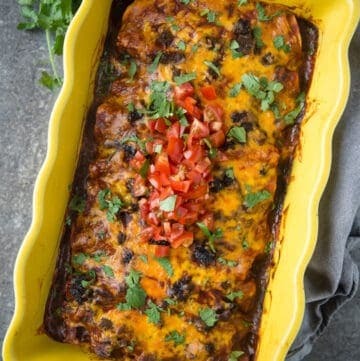 If you like this recipe we’d truly appreciate it if you would give this recipe a star review! And if you share any of your pics on Instagram use the hashtag #vindulge. We LOVE to see it when you cook our recipes. 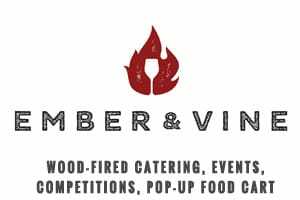 Thank you to 90+ Cellars for sponsoring this post. As always all opinions, thoughts, and recipes are my own. What a stunning chicken dish! 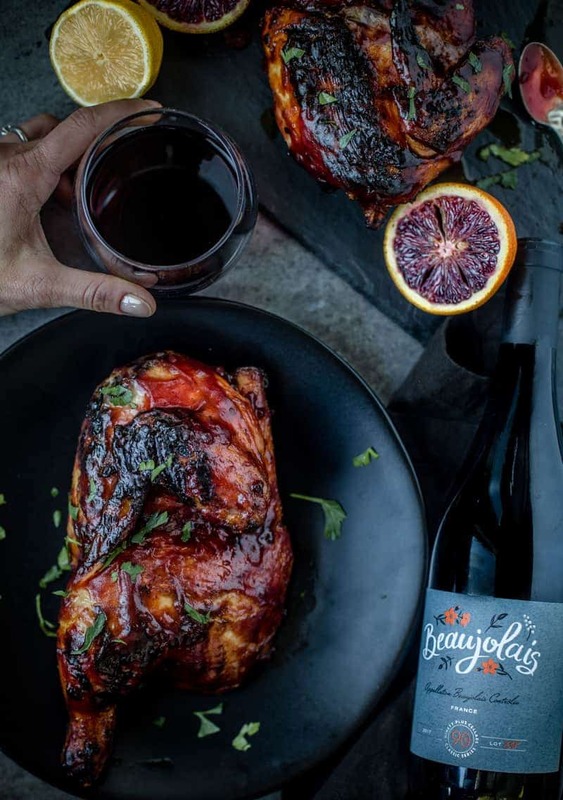 I love the sound of that glaze – Smoky, tangy, spicy… And the wine pairing with Beaujolais sounds perfect too! This look very tasty on pictures. The post provide very clear instruction. I will try it for Christmas and feedback you after. Thanks for nice recipe. Send us photos and thanks so much for the feedback! !